For those Belle & Sebastian faithful who've loved the band's many hats and faces; from the minimalist early work to the '70s power pop stylings of Dear Catastrophe Waitress to The Life Pursuit's more direct indie twee, God Help The Girl (Stuart Murdoch's brainchild album to accompany the upcoming 2010 film release) will feel like a sort of homecoming. Not in the sense that it rehashes anything that's already been perfected, but more like returning to your childhood home after college: much is just like you remembered, but so many things are different too. The album establishes the plot and characters for the film, intended to be a musical of sorts, by following a girl's departure to college, her interest in music, discovery of new love, and loss of herself into depression during that time in life where we all tend to define and redefine ourselves continuously. Beautifully, the music syncs to the wistful, energized and sometimes utterly devastating path of growing up. Songs like "Pretty Eve in the Tub" present us with classic Stuart Murdoch vocals and the trademark acoustic guitar that first made Belle & Sebastian appealing, but these simple moments are few and function to strong effect. Quiet acoustic bits are nestled within some brilliant, broad orchestration filled with strings, keys and horns. But, the greatest treat are the vocal performances turned in by Catherine Ireton (as the lead, Eve), Brittany Stallings, Celia Garcia and Dina Bankole. A collection of soulful voices like these coming together to build a musical out of sincere indie rock writing is a little like stumbling upon a swimming pool full of gorgeous women on a sweltering day. We first hear Ireton on "Act of the Apostle" where she croons sweetly about the genius inside her that is hidden by her sadness. It's a poignant, solemn start to an album that bounds toward personal discovery. Stallings shines brightest with the almost-unrequited love anthem "Funny Little Frog" that melds funky guitar with soul-rock melody. It's my favorite song on the album, as well as a pseudo-bright spot that still tells the story of a woman distances from what she loves. Then, a song like "Perfection as a Hipster" comes along and the about perfectly fits the mold of a Broadway musical, with call and response and melodramatic lyrics. And Asya's turn in "I Just Want Your Jeans" may be one of the best empowerment/concession songs in the last year. It's impossible not to praise Murdoch for undertaking such a huge project. 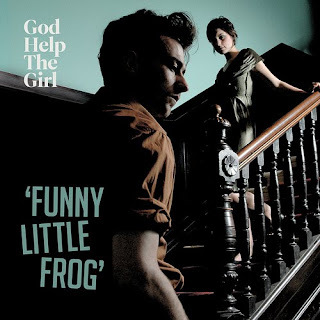 Much as Colin Meloy's work with The Hazards of Love that I lauded heavily last year, God Help The Girl (released last year as well) fights to blend genres and show the multi-dimensional qualities of indie music and its songwriters. These are "rock stars" who are also well-studied intellectuals, and these sorts of crossover projects, however difficult to embrace at first are elements of a musical renaissance. Acknowledging the ways music can effect its audience, either to inspire dance or introspection, or to convey a complex narrative, shows that Murdoch has only continued to build from the iterations we've heard from Belle & Sebastian. Now, since it is 2010, I am most intrigued to see how the film is executed and if, like reading a book before seeing the movie, hearing this story through my speakers can be adequately captured on screen.